Renamed the Tom Landry Freeway after the famed head coach of the Dallas Cowboys, Interstate 30 bee lines east from Fort Worth to Arlington, Grand Prairie and central Dallas. The toll road ended at Interstate 35E, just north of the Mix Master Interchange south of Downtown, leaving IH 30 as a free route east to Mesquite, Garland and other eastern suburbs. Beyond Dallas, Interstate 30 overlays U.S. 67 northeast to Greenville, where the route turns east toward Sulphur Springs and Mount Pleasant along a rural course. Another northern shift ensues there, taking IH 30 to New Boston, the Red River Army Depot, and Texarkana. Once in Arkansas, Interstate 30 remains a busy trucking corridor as it swings northeast to Hope, Prescott and Arkadelphia through increasingly hilly terrain. 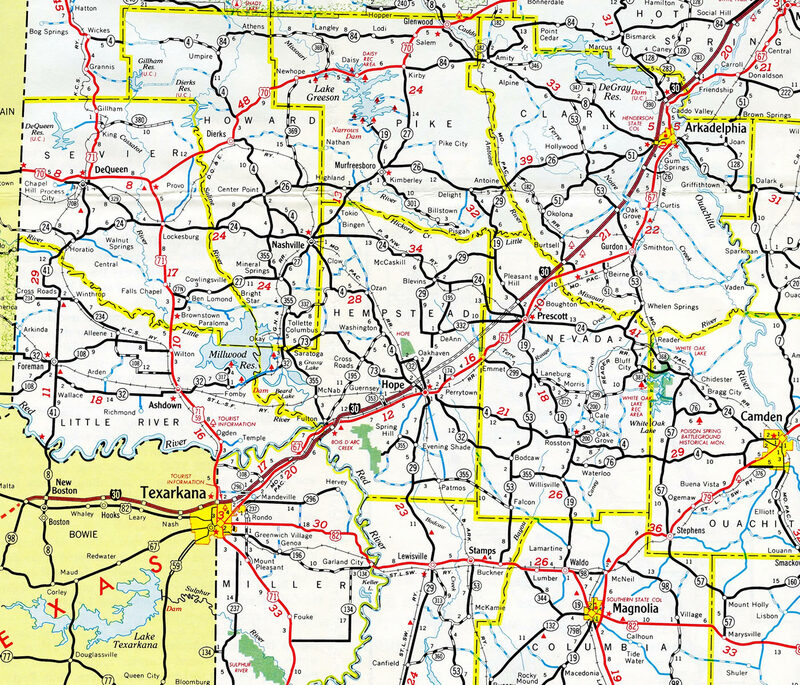 Further east along I-30, the freeway reaches Benton and the far outer suburbs of Little Rock. I-30 increases in capacity on the northeast approach to I-430, I-530 and I-440 within the capital city. Combining with U.S. 65 and 167 at the end of I-530, I-30 turns north for its final push toward Downtown Little Rock, North Little Rock and the eastern terminus at Interstate 40. Interstate 30’s original name in Downtown Little Rock was “The Little Rock Expressway” from the Arkansas River to University Avenue. The U.S. 67/167 freeway in central Arkansas is often called “The Jacksonville Freeway” because this road originally ended in Jacksonville at the Air Base Exit for Little Rock Air Force Base. This freeway continues today to Newport. In Western Arkansas, I-540 between I-40 and Bentonville is named the “John Paul Hammerschmidt Freeway” in honor of northwest Arkansas’s former U.S. Representative. Interstate 30 is part of High Priority Corridor 55: Dallas to Memphis via Little Rock between Dallas and Little Rock. The turnpike did not come without compromise however. To sell the idea to the city of Arlington, an east-west connection to Grand Prairie was required. This was accomplished by constructing Texas 303, the Pioneer Parkway, which was completed in 19605. Turnpike bonds were paid off 17 years ahead of schedule. As a result, the toll road was turned over to the state.1 Tolls were then dropped along the 32-mile highway in 1978.4 Interstate 30 remains as the only Interstate highway in Texas to have ever been tolled. All of the toll highway projects added or proposed since 2000 are not proposed Interstate routes. 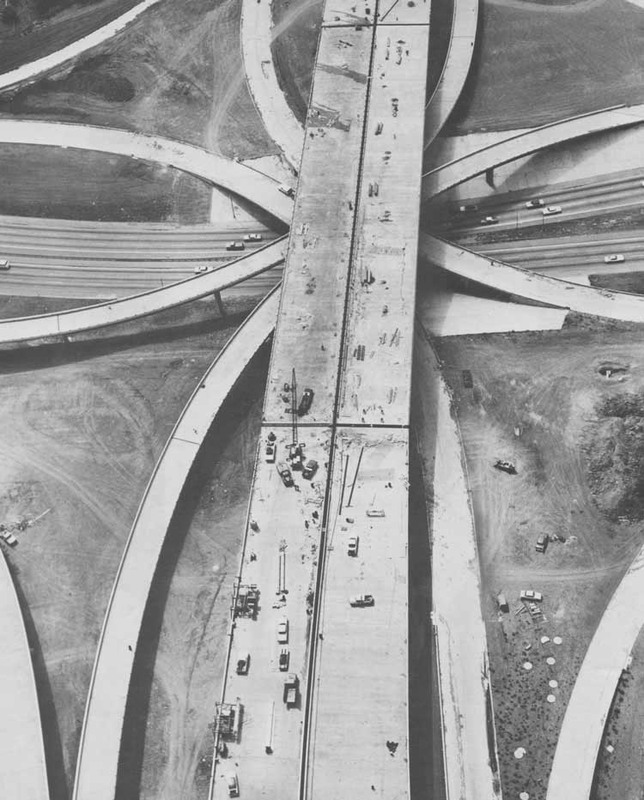 Aerial view of the IH 30 & 45 symmetrical stack interchange in Dallas during 1970 construction. IH-45 was completed later than other freeways in Dallas due to stiff community opposition. This photo is part of an Dallas Urban History set contributed by Justin Cozart. 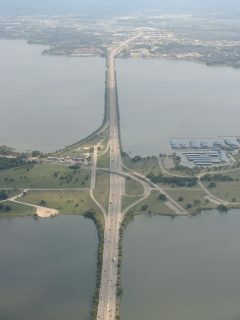 Interstate 30 crossing Lake Hubbard east of Dallas, Texas. The interchange pictured here joins the freeway with Darlock Road between two causeways. This photo was part of an aerial set covering Dallas area roads shot by Justin Cozart. Interstate 30 through southwest Arkansas – 1971. 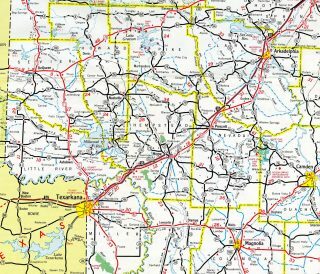 The final portion of Interstate 30 completed in Arkansas was the stretch between Hope (Exit 30) and Prescott (Exit 45). The Dallas-Fort Worth Turnpike in 1972. The toll road ran east from Oakland Boulevard in Fort Worth to IH 35E in Dallas. Most interchanges along the route consisted of trumpets with access roads connecting adjoining roads. In Texas, Interstate 30 was an original Interstate Highway, and it was approved by the Texas State Highway Commission in 1962 with 240 miles.10 The 32-mile Dallas-Fort Turnpike was added to I-30 in 1978. Interstate 30 was upgraded in the vicinity of Texarkana, Arkansas, with new interchange construction at both Interstates 49 and 369. Improvements to I-30 included the construction of a new travel plaza (welcome center/rest area) near the Mandeville interchange (Exit 7). This project replaced the former facility situated between the Jefferson Avenue (Exit 1) and Arkansas 245 (Exit 2) interchanges and was completed in 2004. Additionally in the Texarkana area, two interchanges were modified. The Jefferson Avenue and Arkansas 245 (now Four States Fair Parkway) overpasses at Exits 1 and 2 respectively entailed two-lane bridges over I-30. These were replaced with wider bridges after 2004. That work preceded construction to modify the full cloverleaf interchange with State Line Avenue (U.S. 59 & 71) into a split diamond interchange using frontage roads and adjacent work to relocate ramps for both Summerhill Road (Texas 93 south / FM 1397 north) and Jefferson Avenue. Interstate 30 eastbound crosses the Arkansas River and leaves the city limits of Little Rock for North Little Rock. The first of two North Little Rock interchanges is with U.S. 70 at Exit 141B. Photo taken by Chris Patriarca (05/03/03). The final exit along I-30 east connects with Interstate 40. The ensuing off-ramp departs for 15th Street to North Little Rock. Photo taken by Chris Patriarca (05/03/03). The three eastbound lanes of Interstate 30 approach I-40. The middle lane is optional for both west and eastbound I-40. U.S. 65, 67, and 167 are all overlapped with I-30 at this point. U.S. 65 departs via I-40 west while U.S. 67/167 turn northward for two miles on I-40 eastbound. Photo taken by Steve Hanudel (08/18/05). The last sign bridge of Exit 143 before Interstate 30 branches into east and westbound ramps to Interstate 40. Eastward, Interstate 40 travels to the city of Memphis in 132 miles. U.S. 67/167 share a freeway (Future I-57 corridor) from North Little Rock northeastward to Searcy and Newport. Photo taken by Steve Hanudel (08/18/05). Interstate 40 Arkansas shields, posted at the gore point of Exit 143A/B. U.S. 65 continues west along side I-40 for 28 miles to Exit 125 at Conway. Photo taken by Steve Hanudel (08/18/05). The proximity of Arkansas 107 to the exchange reuslts in an independent ramp from I-30 west / U.S. 65 north to the state highway connecting North Little Rock with Sherwood and Macon. Photo taken by Eric Stuve (12/19/02). Just after the merge of U.S. 67/167 southbound onto Interstate 40 westbound at the North Hills Boulevard overpass (Exit 154) is this set of signs for the pending split of Interstate 30 west from Interstate 40 west. Photo taken by Chris Patriarca (05/03/03). The westbound beginning of Interstate 30 departs Interstate 40 from the left as Exit 153. U.S. 67/167 depart as well, as U.S. 65 takes their place with Interstate 40 westbound. Hazardous Cargo is prohibited from traveling the downtown Little Rock area freeways. Traffic continuing westward will reach Fort Smith in 150 miles. Photo taken by Chris Patriarca (05/03/03). The first westbound Interstate 30 reassurance shield as seen from the Interstate 40 westbound mainline. The first interchange of Interstate 30 is Exit 142 with East 15th Street in North Little Rock. Photo taken by Chris Patriarca (05/03/03). Interstate 40 eastbound at Exit 153A for Arkansas 107 (John F. Kennedy Drive), just ahead of I-30 and the split with U.S. 65 south. Arkansas 107 begins here and heads northward to Sherwood and Little Rock Airbase. Photo taken by Chris Patriarca (05/03/03). Exit 153B for the westbound beginning of Interstate 30 departs from I-40 east. There are four more North Little Rock interchanges along Interstate 40 in the next five miles. I-30 enters Downtown Little Rock in three miles. Photo taken by Chris Patriarca (05/03/03). There are no warning signs or other notifications along westbound Interstate 30 of the pending junction with Interstate 20. The two freeways combine at a wye interchange. Photo taken by Robert Lee (06/02/06). The zero milepost appears under the Interstate 20 overpass, as IH 30 merges onto IH 20 westbound. Photo taken by Robert Lee (06/02/06). Four lanes of Interstate 20 push eastward toward the split with Interstate 30 at Exit 421. 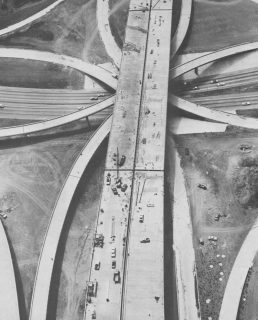 The Interstate segment to Interstate 820 predates the Interstate 20 segment to the same highway by a number of years. 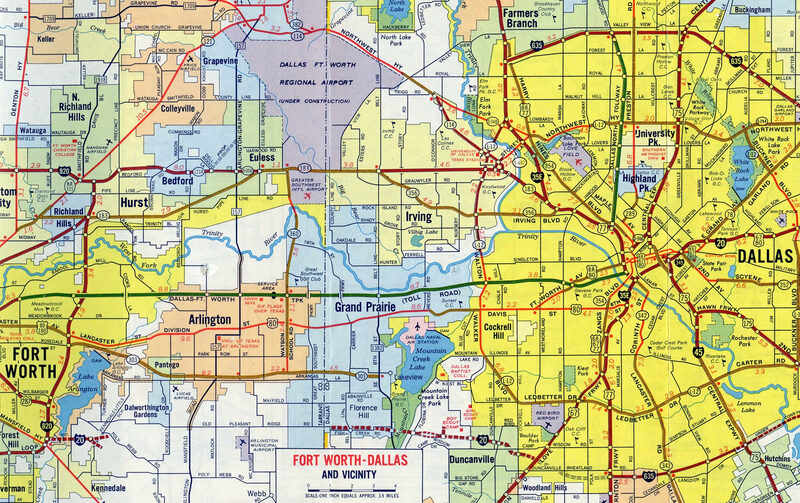 Interstate 30 between Dallas and Fort Worth dates back to the 1960s as the Dallas/Fort Worth Turnpike. Photo taken by Robert Lee (06/02/06). Now within one half mile of the Interstate 20/30 split, the first Interstate 30 interchange is Exit 3A/B with the Jim Wright Freeway – Interstate 820. Otherwise Interstate 30 is designated the East-West Freeway as it enters Fort Worth. Photo taken by Robert Lee (06/02/06). Interstate 30 eastbound begins as Interstate 20 branches to the southeast to bypass the city of Fort Worth. Interstate 30 will reach downtown Fort Worth in 14 miles and the city of Dallas in 40 miles. Interstate 20 enters the city limits of Forth Worth in ten miles. Photo taken by Robert Lee (06/02/06). Texas Tollways – F.A.Q. http://www.texastollways.com/tta/faq.asp TXDOT Texas Turnpike Authority Division. “Putting Customers in the Driver’s Seat: The Case for Tolls.” Reason Public Policy Institute, November 2000. “Interstate undergoing many changes.” Texarkana Gazette, October 17, 2003. “Ark., Mo. leaders share 67 plans.” Poplar Bluff Daily American Republic, David Hammer, April 23, 2004. Page updated April 25, 2016.